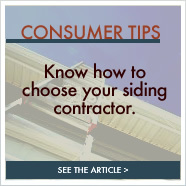 Metro Siding recognizes that your home is the single most important investment that you will ever make. Our dedicated staff of Experienced Professionals is committed to "Total Customer Satisfaction", using recognized industry leading materials, quality workmanship, and exceptional service. You can count on Metro Siding to "Create First Impressions To Last A Lifetime."